Patty Gilbert is super stoked to see her college boyfriend Jim Hollis over the weekend. Their long-distance relationship is fairly solid, but it doesn’t mean she doesn’t miss him when he’s at Pacific College. When her mother tells her that her older sister Jana is also coming home for the weekend, Patty is conflicted, because there’s no way to spend enough time with both of them, apparently. Patty tries to get ahold of Jim before he comes down to ask him to switch weekends, but he doesn’t answer his phone. When Patty goes to his house and tells him that she also has to spend time with her sister, Jim FREAKS OUT on her and they have a huge fight. Patty throws a pillow at him and storms out. When she gets home, she finds that her sister Jana is already there…with her new fiancee. Patty is shocked that Jana is engaged, and is even more alarmed when all Jana wants to talk about is her wedding, which is apparently happening in two weeks. The two girls end up having a huge fight and stop speaking to one another. Patty feels fairly isolated, as she isn’t speaking to Jim or her sister. When she sees Jim out with another girl, she goes to the deep end of the pool and assumes that he’s either cheating or has moved on. This is a little fuzzy, because was that really a break up? There’s a craft fair going on in town, and DeeDee Gordon is selling her painted t-shirts at it. There’s a stupid subplot where Jessica covers the booth for her and talks to some dude who wants to buy her shirts and sell them at a boutique. Jessica tries to make her own shirts and they’re a disaster. She also buys some earrings at the craft show and mentions to Liz that they were made by Jim’s cousin, who was in town from L.A. for the craft fair. Liz puts it together that Jim was out with his cousin. When Liz goes to Patty’s house to tell her, she talks to Jana about Patty and Jim’s breakup and is surprised that Jana didn’t know about it. When Patty gets home, Liz tells Patty what she knows, and Patty writes Jim a letter but doesn’t send it, because what’s the point? SERIOUSLY, WHAT IS THE POINT? Jana sneakily sends the letter to Jim. The sisters make up and Jim shows up at the wedding to reconcile with Patty. Both Jana and her fiance conspired to get Jim to the wedding, and Patty realizes how much they both care about her or whatever. Everyone is happy. This book SUCKED. Patty’s mom works at a computer consulting firm. 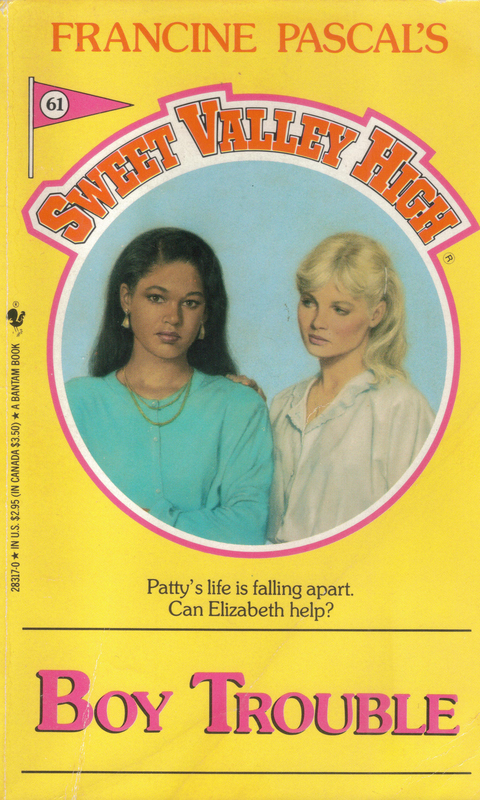 “Although everyone liked Elizabeth, Patty felt she and Elizabeth shared a special bond since the time they had teamed up to help DeeDee regain her self-confidence by putting her in charge of the school talent show” (7). I’m not sure what there is to say about this one. The entire plot is so thin and so boring that it’s almost not worth tearing it apart. I don’t know what the plan was with these books that focus on tertiary characters, but because we never see them again, it’s hard to care at all about their stupid problems. Also, the entire timeline of this one is so condensed and ridiculous that it hardly matters–everyone is okay with the fact that they’ve never met Jana’s fiancee and barely bat an eye at planning a wedding in less than two weeks. I don’t know. I’m so looking forward to the next book, because it’s one of my absolute favorites.